Annapolis, MD; January 16, 2018—The Entomological Society of America seeks candidates for the position of co-editor-in-chief of the Journal of Economic Entomology, to serve alongside current editor-in-chief Frank G. Zalom, Ph.D. 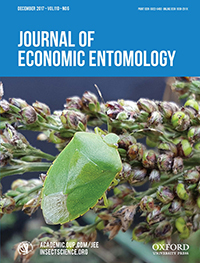 The Journal of Economic Entomology is a peer-reviewed scientific journal that publishes research on the economic significance of insects and includes sections focused on apiculture and social insects, insecticides, biological control, household and structural insects, crop protection, forest entomology, and more. It is ESA's largest journal by publishing volume and the most-cited journal in entomology. A co-editor-in-chief is sought to support the journal's continued high standards and growth in serving the field of economic entomology. The ideal candidate should be a respected and recognized scientist with significant experience in the writing, editing, and reviewing of scientific research manuscripts. A comprehensive background and broad experience in economic entomology are essential. The editor should be able to devote the time and energy necessary to ensure that published articles are of the highest quality and scientific interest to JEE's readers and to advance the quality and reputation of the journal. The Journal of Economic Entomology Editorial Board will review all applications and forward a recommendation to the ESA Governing Board for approval. The selected candidate would begin his or her term in 2019, with the exact start date to be determined based on the candidate's availability. See the complete Journal of Economic Entomology co-editor-in-chief position description [PDF] for further detail. reprints of two published articles that best represent the candidate's work. The deadline for applications is 5 p.m. eastern time on March 6, 2019.